The name of the Association shall be the LASER 28 INTERNATIONAL CLASS ASSOCIATION; hereinafter called 'The Association'. 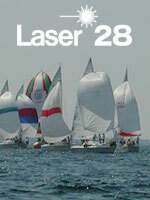 a) The purpose of The Association shall be to govern the affairs of the LASER 28 Racer/Cruiser sailboat. i) To maintain the Laser 28 as a one design offshore sailboat. ii) To develop and support an active programme of high quality one design sailing, racing and recreation in the Laser 28.
iii) To develop and maintain an active membership of Laser 28 sailors through communication and exchange of information. iv) To conduct such other activities as may be proper, necessary or expedient to further the objectives of The Association. a) The Association has jurisdiction over all activities of The Association and its powers shall be vested in and carried out by the Class Executive and Local Fleets. b) The Constitution is binding on all The Association members. c) The Association shall not be liable for any debts contracted by its officers other than expenditures authorised in the approved budget or as otherwise specified in written approval by the Class Secretary. i) The Association shall be governed by the Executive Council (hereinafter called 'The Council') comprised of the President, Measurer, Secretary/Treasurer and Fleet Captains. ii) Council members shall serve for two years and may be re-elected for further periods. iii) The Council shall meet not less frequently than once every 12 months. Twenty days notice of a meeting shall be given to all members of The Council (unless notice has been agreed to be waived by all members of The Council). The notice of a meeting shall include all items to be discussed at the meeting. Only those items included in the notice shall be decided at such a meeting. All decisions made at meetings shall be confirmed by a majority of the members of The Council. Any decision not so confirmed shall not be acted upon. iv) The Council members shall act in the interests of the Class. When 3 or more Laser 28 sailboats are sailing regularly together their owners may apply to The Council for fleet Status and shall elect a Fleet Captain. a) There shall be two categories for membership of The Association, Voting Members and Associate Members. A Voting Member shall only be a current owner of a Laser 28. In the case of a Laser 28 in joint ownership, there shall be only one voting member for that boat. Any person may be an Associate Member of The Association. b) Only Voting Members and/or their spouses, or Associate members may become council members of The Association. If an Associate Member becomes a council member, they will have full voting rights on council issues. In the case of a Laser 28 in joint ownership with both owners serving on The Council only one owner will have full voting rights on council issues. A maximum of 2 members of The Council can be from one Laser 28.
c) Membership in The Association shall not be open to any company, group, partnership or other organisation unless specifically authorised by The Council upon terms and conditions it deems appropriate. d) The Association membership fee shall be payable on March 31st of the year. a) Membership of The Association may be suspended by The Council for gross violation of the Rules or By-Laws or for committing an unlawful act in relation to The Association or one of its members or for any unsportsmanlike conduct. The duration of the suspension shall be fixed by The Council and a suspended member shall, during such period, be precluded from racing or enjoying any other rights of membership. b) Council Members may be removed from office by The Council for wilful or unjustifiable acts of commission or omission detrimental to The Association or to its members. Any dispute arising in relation to The Council or Fleets, eligibility to race, the interpretation of this Constitution, the By-Laws or similar matters may be made to The Council whose decision shall be final and binding. The Council may make By-Laws for the purpose of carrying out the aims and objectives of this Constitution. a) This Constitution may be amended by The Council provided that at least two thirds of the votes received within 30 days from the delivery of a ballot to each voting member are in favour. The two thirds majority must represent at least 40 % of the total number of voting members.